Admit it. If you like soccer in this country you are limited to what ESPN has to offer (1 semi-weekly MLS game and an EPL game on Saturday mornings). That's with basic cable. Otherwise it's airwaves, and you better hope your MLS team is local or you like the Mexican league. That is, as long as either Telemundo or Univision/Telefutura are available. Granted, select Concacaf Champions League games are also available on Telefutura, mostly when Mexican teams are involved. There are also sporadic Uefa Champions League games on the Fox Sports Network. But what about the national team? USA usually plays on ESPN for the qualifiers and international friendlies. You can also catch the Mexican national team if it's a friendly on Telemundo (they hold the rights to games abroad). Univsion usually carries the Mexico-USA qualifier clash. The only other time is during the World Cup. Euro games are also shown on ESPN networks (and occasionally on ABC). Univision has rights to the Gold Cup and Copa America. So if you want to view European soccer beyond the one Saturday morning Premier League match, then you have to spend some money to get digital cable or satellite TV. Usually, at least for cable, Fox Soccer Channel is included in the digital package. For Direct TV, depending on where you are, it may cost extra. Having FSC gives you at least 3 live EPL games and 1 or 2 Italian Serie A matches. More importantly, The UEFA Champions League is shown on this channel, along with MLS-participating Concacaf Champions League games. It also gives you their weekly MLS game along with select women's games (WPS) and NCAA (men's and women's). That's enough to keep some, if not most, satisfied. If one wants to venture out past FSC, then you better hope your region includes ESPN Deportes as a standard channel (New York, LA possibly?). Otherwise it will cost you extra. For Time Warner it comes at $3 per month. It may be more with other cable companies (Comcast may be up to $15 per month). Included in this channel are German Bundesliga, Dutch Eridivisie and Spanish Primera. This usually means you are getting the "Latino" package. Fortunately for you, choosing this option also gives you access to two additional networks: GoalTV and Fox Sports en Espanol. 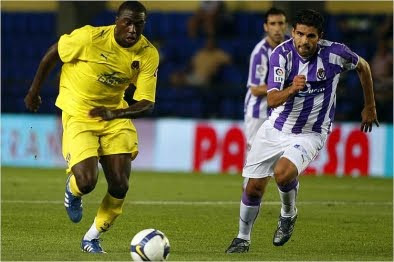 With GolTV there is more Spanish Primera, as well as Brazilian and Colombian football. 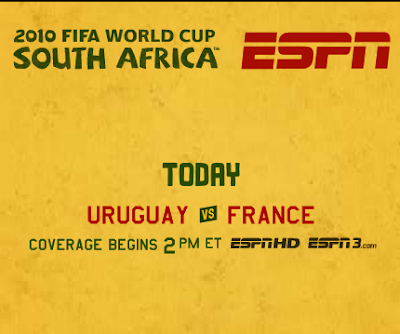 Select World Cup qualifiers will also play in this channel as well as on ESPN Deportes. FSE provides access to the Copa Libertadores, Copa Sudamericana, and complementary UCL games. One additional network is the recent addition Fox Soccer Plus. Not in cable companies in most markets but it is included in the sports package with Direct TV. We now arrive at the internet. Fortunately for some of us that dwell in academia, .edu domains give access to espn3.com. There you can catch pretty much all the action on the ESPN networks. It is also available for Comcast customers. Such is the case in Oregon. But what about Fox? Well, if you're like myself (and many others), then watching the Champions League (UEFA) requires an investment. But don't fret yet. There is always streaming (often unreliable peer-to-peer) video. Until Fox chooses to follow espn3, most internet-savvy soccer fans will access it through other means. It's silly, really. If they keep advertisements going within an online. portal it will only give Fox Soccer more attention throughout America. Hopefully this summary will help some folks out. I will not give away streaming video addresses through here but you can always search for them or follow online threads. Enjoy soccer, America. Plenty of it if you know where to look. As I watched the LA Galaxy and the New York Red Bulls battle it out on Friday night, I caught an interesting conversation between two former USA teammates: Alexi Lalas and John Harkes. I've been quite critical of Lalas in the past for his choice of remarks as a color commentator on ESPN soccer broadcasts. Harkes is a bit more subdued but his words of wisdom do carry some weight. The conversation was about Designated Players in MLS (Beckham, Henry, Marquez, etc.) and it also touched on another factor: American talent. Being four days removed from this conversation, I'm not entirely sure who actually suggested that we should bring back players like Altidore to the US to play in MLS instead of spending money on overage dwindling stars (Beckham) or struggling maestros (Castillo). Is this really true? Should MLS halt player development this way? Lalas himself is a proponent of big teams with big names. He loves superclubs and he's excited to have names like Beckham playing against Marquez and Angel. The suggestion to bring home our top players is unsustainable at this point. As we saw this summer, playing abroad is a significant factor in determining the quality on the pitch at the World Cup. Even Mexico, a team with great tradition in its domestic league, relied heavily on Europe-based players (Dos Santos, Vela, Hernandez, Salcido, Marquez, and so on). Why should the US be any different? There is, however, a flip side to this rationale. 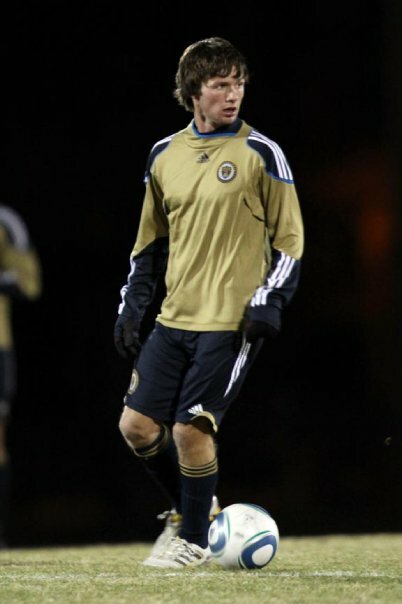 For example, players like Bobby Convey--still in his prim--chose to play in MLS once again. His form had been declining in England and his team (Reading) had begun to phase him out. This predicament has also befallen to Freddy Adu and Oguchi Onyewu. I made a case for Adu's return in a previous post. I stand by it. Adu hasn't made a difference in Europe and even less with the national team. The same cannot be said about Altidore. He may not be putting away his chances, but he's creating dangerous plays and possessing the ball better. Altidore was also a major factor in two World Cup goals: assists on Bradley's tying goal versus Slovenia and Donovan's rebound against Algeria. We have plenty of exciting American youngsters in MLS: McInerney, Pontius, Ream, Gonzalez. As long as the NCAA system keeps developing players, we will have plenty to go around that will not make the jump to Europe. So, to the commentators: no, we shouldn't bring back Altidore, Johnson, Davies. Not yet. The action in MLS continues despite NFL and College Football. Indeed, the bigger markets (LA, NY, Seattle) continue to have strong attendance. It may be safe to say that the dedicated fans are here to stay, at least in these markets. New England and Dallas have a long way to go. A possible switch of Chivas USA to another market might also shake things up. How about Miami? With New York likely to get another team, it would only be fair to grant the US capital of Latin America its own MLS franchise. 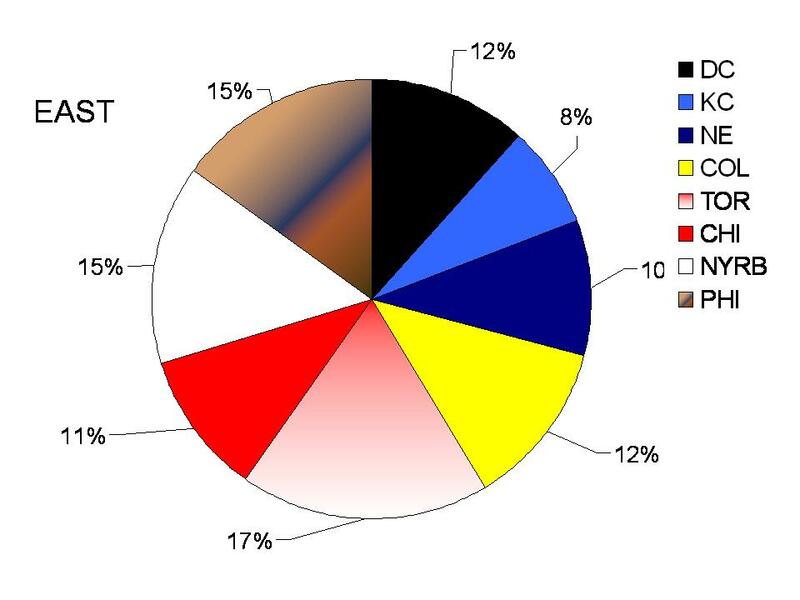 Increased attendance in New York notwithstanding, Toronto's steady numbers (~20500) are highlighted in the pie graph. They hold the larger porportion of attendance compared to the rest of the Eastern Conference. A proposed 30,000 seat stadium expansion may not be a bad idea. Also worth noting is the price of tickets at this venue: $90.78 compared to $79 at Manchester United. Wow. Whether true or not, it should raise a few eyebrows. Maybe TFC can start winning cups for a change? Let's face it. Jozy Altidore isn't the complete answer to the dearth of goals in Team USA's front line. Jozy is a strong, dominant player that creates chances and intimidates the opposing defense. But he doesn't score. Not as much as would be required from a prototypical #9. Further evidence for this is his performance abroad: 1 league goal for Hull City and 1 for Villareal in two years of play. Jozy has been switched to a more standard #11. You could make a case for Charlie Davies as a #9, but his flame was put out just as he was starting to shine. Landon Donovan isn't the prototypical striker either. He works much more as a creative force and scores vital goals (3 in the 2010 World Cup). This brings us to another point: all the goals in South Africa were scored by midfielders: Dempsey, Donovan, Bradley. Older, in-form players like Herculez Gomez and Edson Buddle did little at the World Cup, partly because their use was limited by the tactics of the game. Robbie Findley has also failed to convince. So there you have it: no sole striker. No accompaniment for Jozy. If we look south of the border, things look gloomier for the US. Mexico has a formidable weapon in Javier "el Chicharito" Hernandez and the quiet ascent of Carlos Vela. Hernandez plays for non other than Manchester United while Vela suits up for Arsenal. Impressive stuff. Hernandez scores for Mexico basically every other game. He finds the net easily and is always in the right spot. We can't say the same for any US player except for Donovan. Another important point is the fact that Hernandez is fairly young (22). Altidore is younger (20) but isn't as productive. This blog post is echoed all across the US soccer media, including MLS itself. There are a couple of new hopes in the horizon: Agudelo, Luis Gil, Jack McInerney. I'm following McInerney intently after seeing him in the U-17 tournament. The kid has spirit and scoring ability. He netted twice for Philadelphia Union this season in an impressive manner. He isn't yet a starter but we are seeing him develop into that fairly quickly. Then there is teammate Danny Mwanga. Mwanga is a DR Congo national but is not yet a citizen. He has scored 7 times in 18 games for the expansion side Union. Until prospects like McInerney and Mwanga take the field wearing a USA jersey and score frequently, it is safe to assume that USA will be limited in its scoring opportunities. The USA needs a Chicharito. They need one before the Gold Cup next summer and World Cup qualifiers in 2012. If the title sounds like a cheap sequel or, perhaps, a masterful reintroduction of a superhero, then Bob Bradley's rehiring by US Soccer fits right in. Yes, it's true that Bradley led Team USA to a 38-20-8 record which included a first place finish in their group at this summer's World Cup in South Africa and second place in 2009's Confederations Cup. But is it worth the risk to continue with the same tactics that allowed for porous defense at the World Cup? Just like in 2006, a name that emerged as a possibility for head coach was former Germany international and head coach Juergen Klinsmann. And just like it happened in 2006, nothing ever came from rumored "meetings" he had with US Soccer. Would he have been a better option? It may not all be Bradley's fault when it comes to glaring errors in the USA lineup. Jozy is more of a number 11 than a number 9 (i.e. Davies), so goals from the forwards are hard to come by. The porous defense is likely a combination of factors: recovering Onyewu, aging Bocanegra and DeMerrit, struggling Ricardo Clark. But clearly, Bradley's scheme has also failed to yield positive consequences in this part of the field (i.e. early goals by opposing teams). Finally, there is the complacency that comes along with retaining a coach for a second world cup cycle. Other teams may adapt to Bradley's style and choice of players. The team itself may be in need of new ideas to motivate them to evolve into a stronger unit. Sven-Goran Eriksson did nothing different for England in 2006 than he did in 2002. Same result: exit in the quarterfinals. Bruce Arena had few breakthrough ideas in 2006 and it turned into a disaster. Is the USA doomed to a 3-and-out in 2014? Not yet. Let's give Bradley some credit. 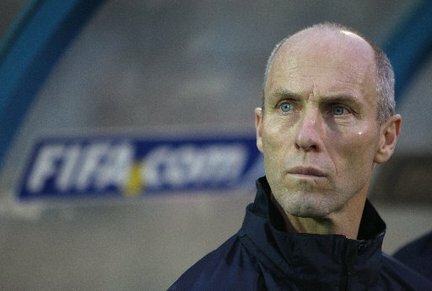 Bob Bradley is a masterful tactician when it comes to big opponents: England, Brazil, Spain. Better game management is required to defeat the likes of Ghana, Mexico, Czech Republic and even Slovenia. This is where World Cups are successful. Winning the key matches and standing up to legendary teams. If Bradley can muster up new tactics and introduce a better defense, then yes, he should retain his job. Can it be done? Only time will tell, and we hope this decision by US Soccer will not develop into another 4-year flop. Cheers, Bob. Good luck. We are behind you as our Team USA coach.